WE have just spent 7 days in this cabin and have enjoyed the view, the cabin and the the guest house layout. It was a wonderful experience for our family. Thank you for everything. Awesome, beautiful, and great view sitting down and having a glass of wine has never been more enjoyable. We loved being close to town and close to lots of things to so. Just a few things we enjoyed were, Clingmanh's Dome, Road to Nowhere, and deep creek, then ending our days in the hot tub and smores by the fire. This was the best end to the best vacation. Thanks for the perfect cabin. Had an awesome time. Cabin was very cozy, loved being in the woods. Was just what we were expecting and more. Loved the trials and went for hike up the mountain behind the cabin. An hour into the hike we found a beautiful waterfall. Really enjoyed our time here. The staff was amazing. We will be back. The staff was very friendly and helpful. They even called to make sure we got into the cabin okay. The staff made it very easy to sign up for the cabin. I loved the fact that she called and checked in on us to make sure everything was ok.
We had a wonderful weekend getaway The Fall foliage was breathtaking. We enjoyed the Great Smokey Mountain Railroad Moonshine car through the Nantahala Gorge, we loved downtown Bryson City. We had so much fine while here. We hope to come back soon. Cabin exceeded our expectations. We had a wonderful time. We came down from Maryland and I must say it was well worth the the drive. The cabin is beautiful and the view is AMAZING! We are for sure coming back ! Can't wait to return, so peaceful and relaxing enjoyed every bit. We decided to have our wedding ceremony at "Walk in the Clouds" based on the pictures on the website. They were AMAZING!!!!!! We will post wedding pics for others to see how awesome it really was. We will be coming back. This was a beautiful cabin in a tranquil setting. We loved the furnishings and the beds were comfortable. We very much enjoyed visiting the sites in the surrounding areas. There is so much to see and do. We enjoyed our stay so much that we didn't want to leave this amazing place. The view is spectacular! We decided to have our wedding ceremony at A Walk in the Clouds, based on the pictures on the web. They were AMAZING!!! The cabin was great. Defiantly coming back. We have so enjoyed our vacation. It has been so peaceful, restful and calming. It was just what we needed. The cabin is very comfortable and I loved the fireplace. It was just the right size for my husband and myself. Our two Aussie's loved it as well and felt right at home. Thank you for your service and will recommend you to our friends. Another marvelous time at Millstone Lodge! We love it here. The view is even more spectacular the the cut trees. Always lots to do in this area. Thank so much. I am so glad that we have found this place on the web! 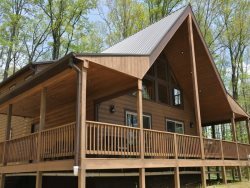 We are celebrating our 20th anniversary, so we knew we wanted something special and the cabin was everything we hoped for. It was great jumping off place for many adventures in the great country that is the Smokies!!! Thank you so much for a wonderful place to stay. Awesome cabin! We had a great time white water rafting, horse back riding, and hanging out in the hot tub watching for shooting stars.